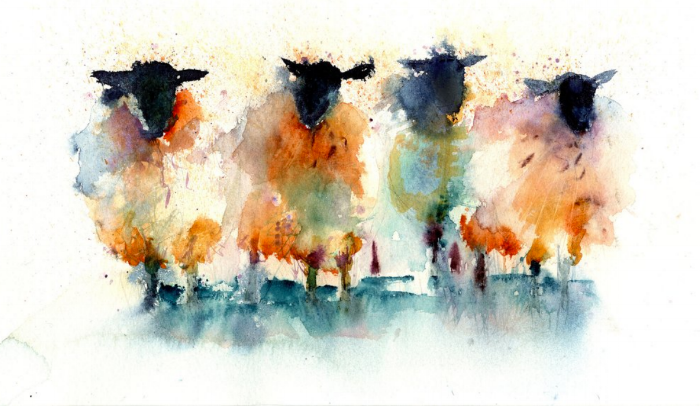 Artist Jen Buckley makes beautiful sheep art. Find it here. This Sunday is Reign of Christ Sunday, also known as the Feast of Christ the King. It is the last Sunday of the liturgical year and the last of Ordinary Time. Next week we will begin a new church year, which opens with the Advent season. Before him, we were confused about your nature. We thought we had to get on your good side. That we can trust in your justice, and in your mercy. This week's Lectionary selection includes the story of Jacob wrestling with the angel of God, and coming out with a limp. Most of us come out battered at worst, bruised at best. Certainly bearing scars. None of us are exempt from trouble. The worst is when we choose to not to engage. But unchanged and unnamed (1). Help us to learn every lesson the first time, thoroughly. Help us to go deep, without fear. Until you’ve given us your blessing (2). We will know: we are better off than before. And yet our lives are preserved (3). *substitute the term of address for God that suits your community best. I like Yahweh, or YHWH. I also like Creator. But if God is most comfortable for you, use that. The story of Jacob and Esau is part of this week's Lectionary reading. The heartbreaking story of brothers who opposed one another and competed from the beginning, who only made peace after a lifetime of heartache and pain. We were taught to hate. We were expected to compete. We were initiated into heirarchy. We never expected another way but to rule or be ruled. We have never known anything different. And blew our minds open with a new gospel. To regard God, not as enemy, but as friend. The old ways are passing away. Give us hope for the future. This week's Old Testament story is the account of Abraham's willingness to sacrifice his son Isaac. God stops him, and gives him a ram to sacrifice instead. Abraham had already experienced quite a few miracles up until this point, but I still wonder if he was surprised. Did he feel a weight of dread lift from his shoulders? Did he feel unburdened when he realized he no longer had to prove his obedience to God, that God was merciful? We don’t have to save ourselves. We don’t have anything more to prove! Slaves to shame and darkness. Free to speak peace into being (3). Free to offer mercy and serve grace. Free to share generously from your abundance. Are all that consumes us now.